top left: me and my bike (right after shopping)... I forgot.. I don't have bike. The next pic: A professional Skier from Malaysia. The right pic: Again... Hari Raya Celebration. 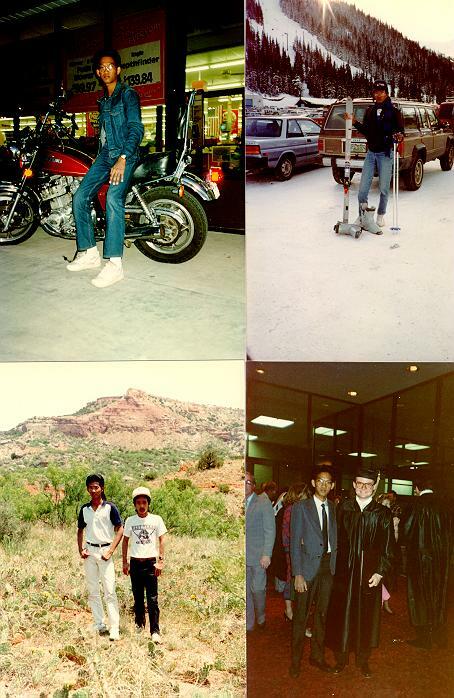 Bottom left: Wanted to be an archeologist (somewhere in Palo Duro, Canyon TX). Next to it, my good friend .. but i forget his name. Middle right ... of course ... my graduation day ... surrounded by girlfriends. The bottom right pic... brainstorming session ... venue: my apartment ... we were enjoying eating ice cream during a break. More pictures....: Keep yourself updated..ok!! FLY BACK: Do you have enough money?